Many customers ask us to compare the different types of 3M Filtrete® Filters available today. Below is a visual comparison of the 3 1" filter types we sell. 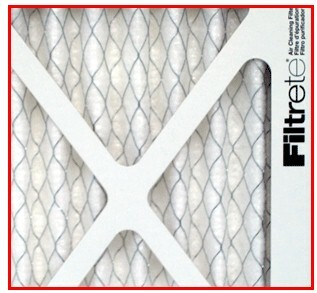 For starters - the 3M Filtrete® are the highest quality 1" filters found on the market today. Each filter is individually wrapped and the factory packaging is excellent. We have found that these filters tend to "run larger" than some of the other pleated filters we sell. Typically, there is only a 1/8" to 1/4" undercut from the nominal dimensions. Other filters we sell may be undercut up to 1/2" under the nominal dimensions. Example: 3M 20" X 25" X 1" filters will actually measure 19-3/4" X 24-3/4" by 7/8". This can only mean a tighter fit in the filter slot. We always advise you to measure your filter enclosure to make sure this tight fit won't be a problem. 3M does not use the industry standard "MERV" rating when describing the performance of their filters. Rather - you will see a Microparticle Performance Rating (MPR) given to each filter. While MPR may not help compare the Filtrete® products to other filters - it is useful in comparing the Filtrete® filters to each other. As you might imagine - the higher the MPR, the higher the cost of the filter. As you can see from the photos below - the higher MPR Ultra and Advanced Allergen filters have MUCH more media packed into the frame and might tighter pleat spacing. The higher cost is certainly justified as it takes much more in the way of materials to make the filter. A common question is: Do 3M Filtrete® filter restrict airflow? 3M assures us that this is not the case! These filters are carefully engineered to operate in virtually all residential heating and cooling systems. Pressure drop is a measure of the filter's ability to allow air flow through the filter media and is also an indicator of filter life. A lower pressure drop number means better air flow. Pressure drop numbers for Filtrete filters fall within acceptable ranges. 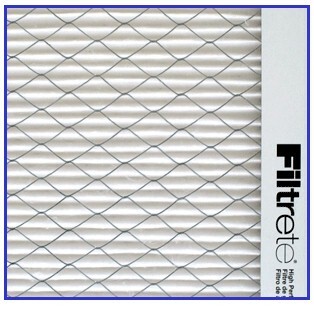 Because of their high efficiency, Filtrete filters trap large quantities of particles during use. That's why it is very important to observe the filter change schedule of these filters. Of course, the effectiveness and life of a filter can vary and will depend on the individual conditions in a home. Unusually dirty duct work, construction or sanding projects, the number of pets, and the presence of smokers or burning candles are some of the things that can shorten filter life. All this said - it is not adviseable to keep these filters in use for more than 3 months! If a Filtrete filter remains in use longer than three months, it may begin to restrict airflow or cause the system to malfunction. It also could restrict airflow in some higher efficiency/air conditioning systems. In this case, change the filter more frequently. The Filtrete® Ultra Allergen Reduction Filter carries a 3M Microparticle Performance Rating (MPR) of 1900 - roughly equivalent to a MERV 13 rating. This is one of the highest performing 1" filters you will find. Fiberglass filters were originally developed to protect your furnace and/or air conditioning system. They were not intended to significantly improve your indoor air quality. Filtrete filters do both. They improve your indoor air quality by attracting and capturing allergy-aggravating microparticles, and help keep your furnace equipment clean. Air in your home is continually re-circulated through the filter, and is cleaned with each pass through the filter. Surprisingly, expensive washable/reusable filters are similar to fiberglass filters in their inability to capture microparticles. What does electrostatic really mean? 3M's electrostatically charged media contains both positively-charged and negatively-charged fibers. The particulates in the air passing through the filter will be either positively or negatively charged; therefore, the charged particles will stick to the filter. No, but in the case of tobacco and wood smoke, removing the smoke particles can help reduce the odor. Filtrete filtering material will not support the growth of bacteria, mold, mildew or fungi in normal use. No unnecessary chemicals have been added to the filters. The recommended change interval is three months. However, the effectiveness and life of the filter can vary and will depend on the individual conditions in your home. Unusually dirty duct work, construction work, furniture or drywall sanding, pets, the presence of smokers and running the fan continously are some of the things that can shorten the life of your filter. In these cases, change the filter more frequently. 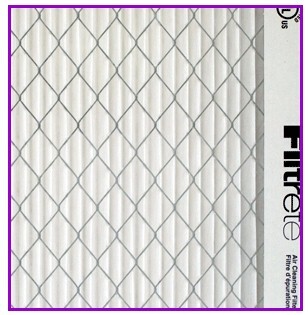 Filtrete filters are designed to operate in most residential furnaces and air conditioning systems. If a Filtrete filter remains in use longer than three months, it may begin to restrict airflow or cause the system to malfunction. It also could restrict airflow in some higher efficiency/air conditioning systems. In this case, change the filter more frequently. Will the Filtrete filter eliminate the need for dusting? No, Filtrete filters will reduce the need for dusting but it won't eliminate it. Atmospheric dust consists of a wide variety of particulates ranging in size from 0.001 micron to a relatively large 100 microns. Because of the weight of the large particles, they will settle out on your furniture long before they reach your filter. How does the Filtrete filter compare with electronic air cleaners? The efficiency of 3M filters approaches that of the top-of-the-line electronic air cleaners. The best electronic air cleaners are effective in capturing particles down to 0.1 microns while the Filtrete Ultra Allergen Reduction Filter is effective down to 0.3 microns. Some tests indicate that in the large particle size (range 1.0-10 microns) the Filtrete Filter is more effective. Top electronic units cost $500 - $800 and require monthly maintenance.